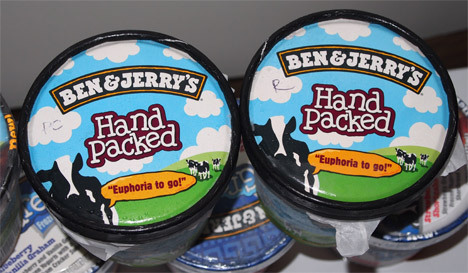 So, how was the 2012 version of your National Ice Cream Day? Mine was way too tiring and wasn't exactly what I had planned. We had toyed with going to Six Flags, or visiting the ice cream trucks at the Food Truck Festivals of New England, or maybe just doing another Sundae Sunday post, but everything fell through... well, almost everything --- Fear not, for the weekend is not a total loss. Our buds at Ben & Jerry's have hooked us up! You see, earlier in the week their PR firm was asking if I wanted to give away a Greek Froyo prize pack. I said sure, why not, it's for the people. Well, we got home yesterday to find a package waiting by the doorway. That looks like ICE CREAM!!!! BEN & JERRY'S ICE CREAM!!!! Oh the excitement! The only thing better than ice cream at your door is unexpected ice cream at your door. I was psyched and couldn't wait to dig in --- but I was good and I waited until today. Well it's today, so let's dig in. So we've got one of each of the Greek Froyo flavors (my wife will be excited) and we've got Chocolate Therapy (I'll save that for my daughter), but what are these other two things? Cryptically labeled PC and R? Oh the suspense! Do I feel special? OH YEAH! I have to know what R stands for first. Nope!! R stands for Rainbow Sherbet!! Or should I say Rainbow Sherbrrrt? You know the best part? Ben & Jerry's Rainbow Sherbet is really good! I knew that they quietly make a few Sorbet flavors here and there, but I had no idea that they spruced up summer with a sherbet. I love sherbet and this is spot on to my liking. Lots of flavor, good texture, not to salty, and nothing funny going on. I could easily polish this pint off without even trying.... in fact, I'm trying to stop myself from finishing it right now because I need to know what's in the other container. Now what does PC stand for? 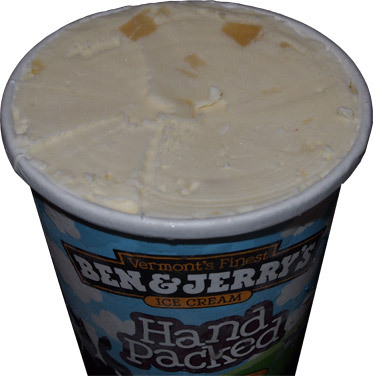 That's right, Ben & Jerry's has created a Pina Colada ice cream and you can try it too if you find a Scoop Shop that carries it --- Wait, you want to know what it is first? Having never had a Pina Colada, I had no idea what it would or could taste like. Will this be another Dublin Mudslide or Bonaroo Buzz? Will it taste of.... oh, it doesn't even smell like anything. Let's just scoop it already. WHOA! It tastes like those coconut macaroon cookies. Oh, I hate coconut.... At least I thought I did, but this ice cream is excellent! You guys know I despise coconut, but that hasn't stopped B&J from trying to win me over with flavors like Fair Goodness Cake. They almost had me with that one, but man oh man they've got me hooked here. This is just such a sweet flavor that I can't stop scooping it. 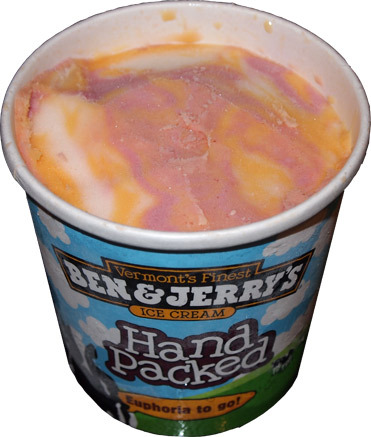 I can't believe I'm saying this, but I want the whole pint. I quickly have my wife check me for a fever and then ask her to have a taste herself. Well, she agrees, it's great! You might have noticed that there are chunks of something in there with the sweet coconut base. Those would be pineapple bits. None of them are terribly huge and they seem fresh enough. You can work a few onto your spoon if you want a little burst of pineapple flavor, or you can just scoop normally and just get a hint of pineapple here and there. Technically I could have done without them, but apparently a Piña colada is rum, coconut cream, and pineapple juice, so I guess you need them in there. They don't add a ton of overall flavor, but who cares, it's the sweet coconut cream that has my full attention. Oh man, I can't believe I'm saying that. 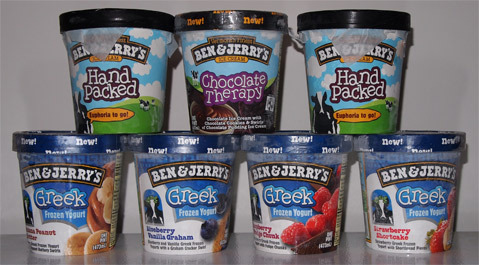 Alright Ben & Jerry, I forgive you for the Greek Froyo debacle, you can be in my good graces again. 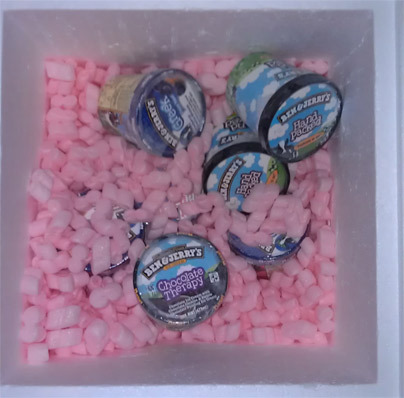 Thanks a bunch for sending these over, we'll definitely enjoy finishing them off ---- Ummm, apparently this awesome ice cream delivery was actually a miscommunication. I never should have received it.... oh well, too late, it's posted! enjoy! I dont drink either but could live off virgin Pina Coladas! I would love to stock a quality sherbet in my freezer, they are so hard to find.